During the height of Harvey’s rains, the most concern has been focused on bayous, which back up into neighborhoods during storms, and flood homes. However, once the rains stop, it will not take long for most of the area’s bayous to fall, and (most) neighborhoods should drain quickly. The concern will turn toward rivers and reservoirs, and neighborhoods near them. We address some of those areas of longer-term concern here. 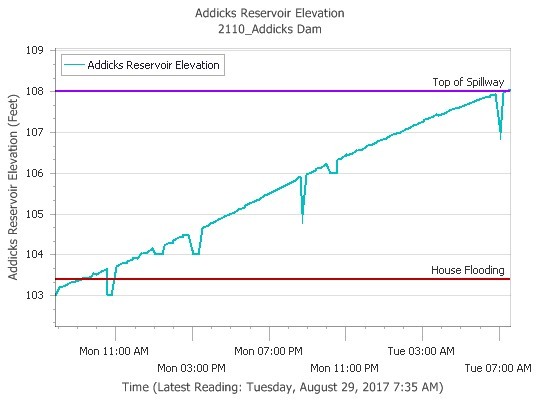 Addicks continues to take in water to the point that the levels have just reached the top of the spillway for the first time on record. Impacts from this sort of unknown at this point, but as releases continue and runoff continues with rains lightening up west of Houston, the suspicion is that runoff should slow gradually. After the Tax Day floods, runoff continued for about a week before the level stabilized and began to drop. Runoffs will take longer this time. The gage at Barker has flooded and there’s no data to report this morning, but the assumption is that we’re approaching a few feet from the spillway here also. They will attempt to put in a new gage today. The forecast has changed a bit this morning, with a slightly later crest at 57.5 feet record levels, and a slow decline back below the old record this weekend. Record crests ongoing at Conroe and Humble on the San Jacinto River. Near record levels expected later this week. 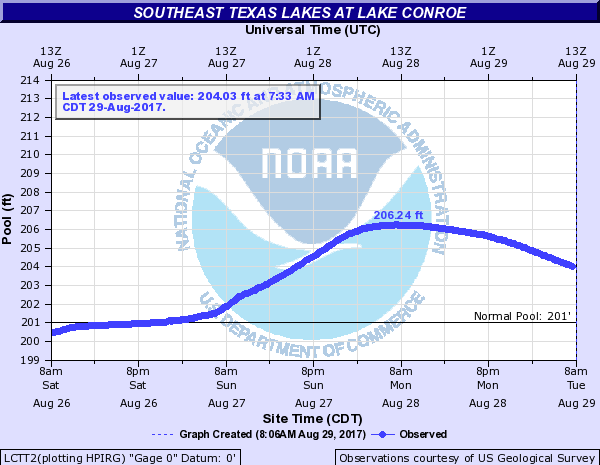 Lake Conroe levels are dropping and back down to 204 feet as of this morning. A slow drop will continue. Finally, we’re starting to see chatter on social media about another hurricane coming to Texas. This is because there is an area of low pressure near the Cape Verde Islands (thousands of miles away) that is likely to develop into a tropical storm and then a hurricane during this week. Some long-range global models have suggested this system may work its way into the Gulf of Mexico in 10 to 12 days time. Frankly, although it’s possible, we don’t think that’s likely to happen. And even if it were to make it into the Gulf of Mexico, the odds are that it won’t affect Houston in a significant way. Here’s our advice: Focus on the here and now, heavy rains, historic flooding, your family, and your property. 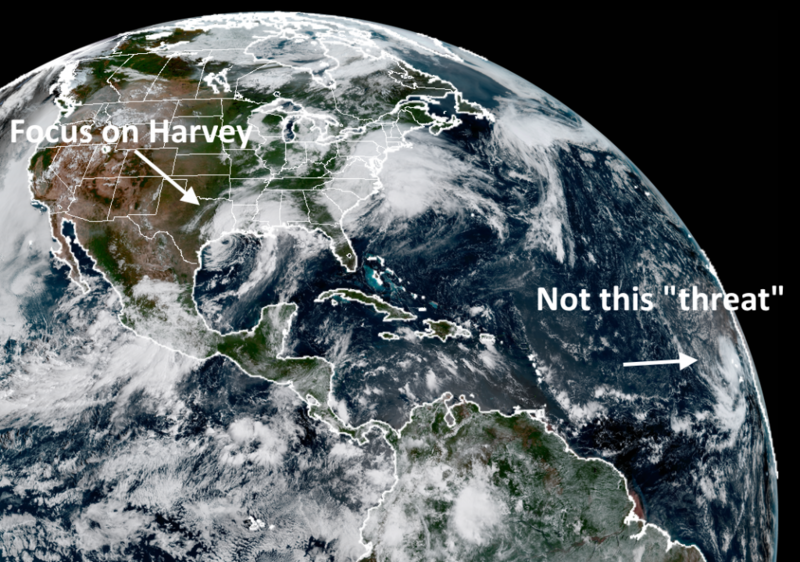 There’s always a risk of additional hurricanes in Texas during the first few weeks of September, but you shouldn’t be more concerned right now just because there’s a tropical wave nearly one quarter of the way around the world. It’s probably not coming here. Howdy, thanks for all you do here. 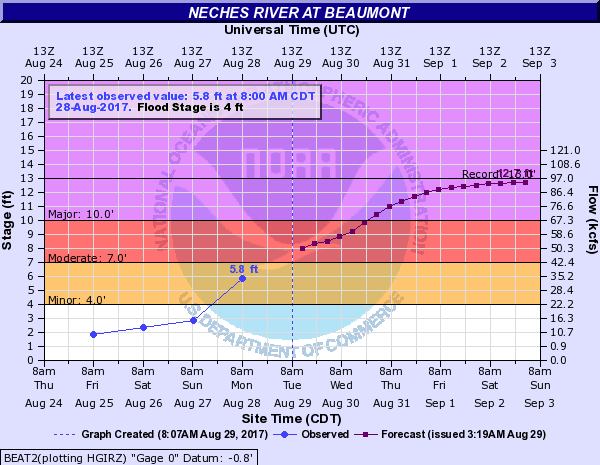 The Brazos forecast was updated at 9:30 and had a significant reduction in crest level down to 57.5 which would keep it within the levees. Just updated this entry, thanks. See high winds near 288 @ 6 in Brazoria. Are tornados still likely from his storm system in the Brazoria &Ft. Ben boarder /Hwy 6 /288 corrido. Echoing everyone else’s gratitude thank you and your colleagues for your well-balanced meteorological reporting. 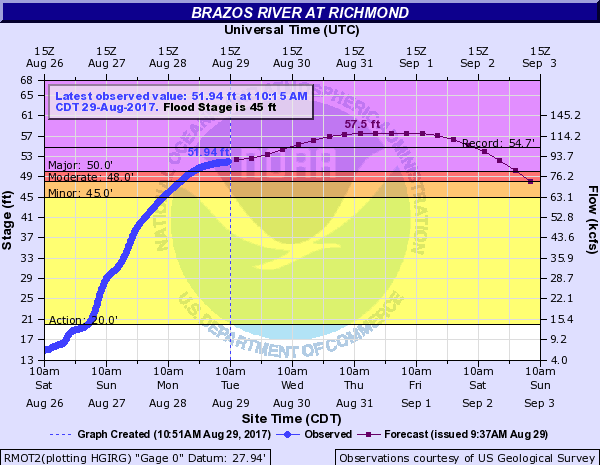 I think the brazos is improving. It fell from 59′ crest to 57.5′ this morning. This is beyond a shadow of a doubt the best weather forecast on the internet! Keep it up. You have been a breath of fresh air through all of this…. Thanks for all you do. We’d rather be a breath of dry air, at this point! Having been a Naval forecaster I can really appreciate what you have done throughout this event. I think you are heroes in you own right. You gave the facts and well reasoned insight about what is likely to happen. You gave hope when there was a reason to give it. You created a tone in your communications that was far better than government leaders were able to and thus you inspired people to focus on what they need to focus on. Thank you! As always, MANY THANKS for the regular accurate no-hype new on the weather. I’ve been a follower of yours since your Chronicle days and you, by far, are the best meteorologist and weather reporter in this area (if not others). Agree! I have been telling everyone about this site for a while! GREAT JOB GUYS!!! What will impact airports reopening? Hobby is scheduled for 8/30, IAH 8/31. Is this realistic? Thank you for everything, Eric and Matt. Thank you to your families for their support of your jobs. You make such a difference to so many people in a way that few are qualified to and fewer capable of your style. Thank you for continuing to give it to us straight. seriously, I don’t know what we would have done without you during the last 5 days. Big props to you and your efforts! I know both of you have been working nearly constantly since this began, and for that I will be forever grateful, but could you perhaps include some information about the Clear Lake area in a later post? Particularly Nassau Bay, Webster, El Lago, League City and what Clear Lake itself is doing? Thank you again for your monumental work!!! What is going to impact airports reopening? Hobby is supposed to reopen tomorrow and IAH on Thursday. Is this realistic? Thank you Eric and your team for the continued level-headed coverage during these very trying times. I also want to thank you. For someone that has family,there but does not live there ,it is great to get straight up reports without all the hyperbole. Thanks for all you guys do. 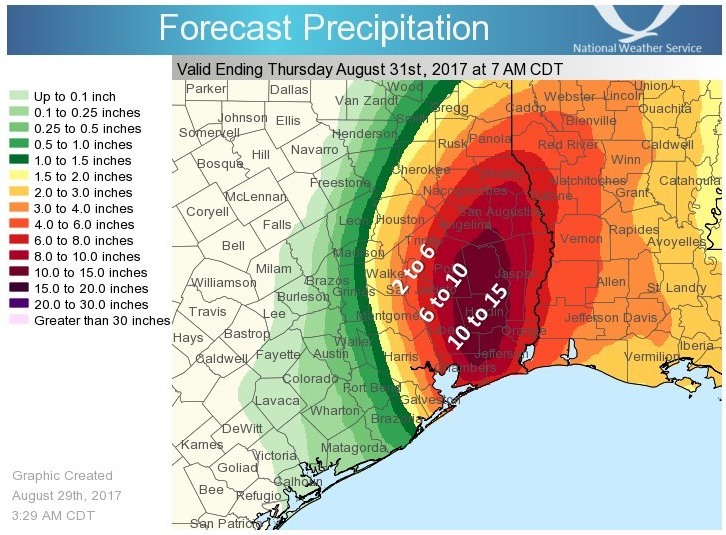 Even though we live in Winnie (the bend in I-10 between Houston and Beaumont), we have been depending on the honesty and humor of your posts during this difficult time. Of course, now we are facing having Harvey track on directly over us on its way north. I know you are primarily for Houston, but it’s really helping us, too. Glad to hear it, Carole. The (slightly) faster movement of Harvey out of here will help us all. Thanks again for all of your hard work guys. Be safe. Thanks for your fine reporting and many helpful insights… so useful to have your clarity and conciseness in understanding Harvey. Even during the darkest moments, I found great relief and a sense of calm reading your posts. Thank you for giving the Houston area (and all the out-of-town family and friends who I sent your link to) something solid to rely on. Thank you for calm and intelligent info. Thank you, thank you, thank you for keeping us all informed, that’s our first defense against getting stuck in a bad situation. Most of us will be happy to buy you all the beer (or any other beverage of your choice) that you can drink! For quite a while! I’m sure you’re sick of these questions, but I’m probably not the only one who will want to know- I’m on the east side of Pearland, in a place where the drainage has handled all the rain. It is a reasonable bet to move stuff back from upstairs today? I agree… Baby steps..Not good to worry about an invest that is too far away to get a clear picture of what its gonna do.. Either we pass these early days being an anxious mess or we stay calm and productive until we know more..We have to deal with the actual problems before us, before addressing the far off potential ones.. Short term all we can do is secure our property..And supplies….And stay.. Or leave.. Some people might spend the remainder of their summer/ fall somewhere north if they have the means….After thinking about it, it is highly unlikely I’ll move away from Houston/ Galveston.. The Weather Channel noted a system already in the Gulf, not the system you referenced as thousands of miles away, that could build at least to heavy rains by early next week. Could you comment on this? Admist all these rumors and nearly opposite predictions given my ‘gurus’ with their ‘models’, this website has been a source of truly reliable information. They covered every piece as it was, straight talk & qualifying wherever they were uncertain. I am your fan now! It’s a relief to read someone who reports without all the hype and “panic” that you see on the networks. Thank you! Thank you guys so much. You are great at giving us the information in a way that feels like a rock to hang onto. So appreciate your help. Thank you for your updates. They were full of straight forward information and provided me with much comfort during this storm. Being in San Antonio and having friends and family in Houston, I felt very helpless. You helped me see the light at the end of their tunnel. Thank you. Eric and Matt, I imagine y’all are both exhausted. I hope that our expressions of gratitude are fortifying and encouraging to you! Your work has not returned void; for me, since I moved to Houston just a few years ago from middle west Texas, I owe my life to you in many ways because of how much you taught me in this blog (and SciGuy as well). Thank you. Thank you so much for your informative and rational weather coverage! I found you through this terrible storm, but will continue to follow and share your wisdom! 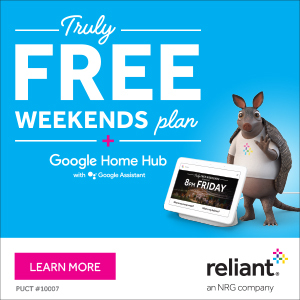 Houston appreciates all you do! Anything about the Trinity River in Liberty? The discharge from the Lake Livingston Dam increased exponentially over the past two days, so everyone is wondering how this will impact our area. Any info would be appreciated! My sister-in-law sent me the link to this website when I asked about her safety from my home state of Illinois, and all the major news outlets made it difficult to separate facts from sensationalism. I’m now a major fan and can’t help but wonder: Do you ever consider covering Illinois, or do I need to move down there? Love your site and glad to see things are improving if ever so slightly. One minor comment: it’s gauge, not gage. 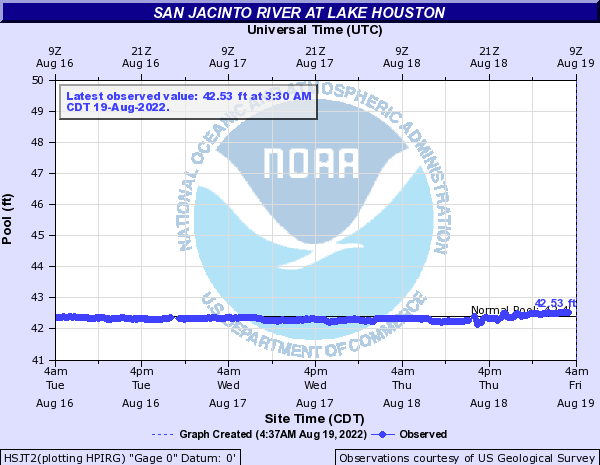 While “gauge” can serve as an alternate spelling, the Harris County Flood Control District uses the “gage” spelling to be consistent with that commonly used in technical reports and by the United States Geological Survey (USGS). Thank you for your good work. Your factual and non-hysterical reporting kept my family in the north east calm. I also would have gone crazy without your reporting. I can’t bear to watch the major news outlets for too long. Your reporting was a calming influence. Please accept the sincerest thanks from yet another Houstonian. You two have provided understanding which leads to optimism and solace for all us. Thank you! You two are true local heroes. of thing down to a dull roar. That was the plan at one point…sort of. 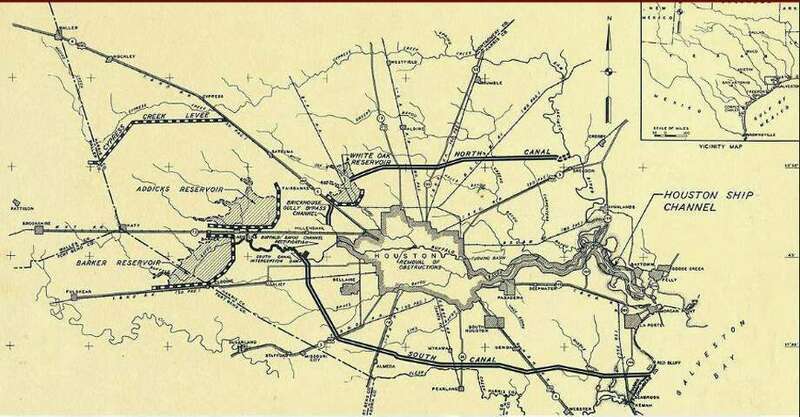 Complete with canals around the city! Thank you so much guys for what you do. You’ve been my primary source of weather news through this ordeal. Your accurate forecasts guided my actions and allowed me to take proper measures. Many thanks for your service. It’s pretty constant even if sensors more upstream has been showing substantial drop. This indicates that there is the level of Barker dam. It’s not as good as the dedicated sensor, but it can provide us some estimation. As I’m sure is true of many people I just found your blog during Hurricane Harvey. Thanks so much for all you do you’ve helped keep us sane during this last week. If only there were a way to get the flood waters of Houston onto the forest fires of western Montana! I took the advice of a lot of groups and sent a donation to the Red Cross for Harvey victims, figuring that would do the most good with my money.